The Grafmatic holder operates automatically. The exposure counter records the exact number of exposures taken. A red indicator tells if film is ready for exposure, or covered. And and automatic numbering wheel numbers each film sheet to correspond with the number of the exposure counter ("45" model only). (a) Open. Dark slide is free. (b) Locked. Red dot covered. Exposures remaining. For temporary filing. (c) Locked. Red dot uncovered. All exposures made. For reference or filing. 1. Set the exposure counter on any number. 2. Press the drawer latch against hte dark slide handle. Hold. 3. Pull out film compartment. While film compartment is out, push in on the dark slide until the drawer latch locks. 9. To operate the counter dial, all six septums must be loaded. Then set the exposure counter to no. 1. 1. Set the exposure counter to No. 1. 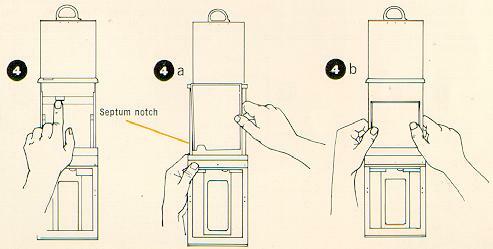 Move the slide lock to open position. 2. Pull the dark slide fully out and push fully back in. (Fig. 5) The first sheet of film will spring into position, ready for exposure. To indicate that a sheet of film is ready for exposure, the red dot apperas, uncovered, on the back of the holder. The exposure counter moves to No. 2. The red dot is covered indicating that the film is covered; at this point, the holder may be completely removed from the camera without exposing the film. 5. On the Grafmatic "23", use the slide lock hook to lock the dark slide before removing the holder from the camera. The Grafmatic "45" will automatically lock the dark slide in place when the letter "x" appears. 4. Follow the same easy procedure for all exposures. When the letter "x" appears, the last exposure has been reached. NOTE: A white plastic tab provides an identification area for the holder. Recesses for locating the tabs are provided at the extreme right and left of the negative numbering wheel. Acetate or India ink may be used on tabs. Cut the tabs 3/8" x 3/8" from a sheet of clear acetate (or clear piece of film) and fasten with a drop of household cellulose acetate cement (Fig. 7).